Learning a language is one of the hardest things to do, but a lot of that is down to the way we study language. When you're a baby, you pick up language by context; you observe your parents and how they speak and you naturally just absorb it. When you're older, you study words in a book and memorise patterns. Bleh. VR is an immersive medium, and for this diary entry I've been thinking about how that could affect the language-learning experience. Could it provide that context that would make learning a new language easier and more enjoyable, the way it is when you actually learn it in the country it's spoken? So I tried it. The first part was easy. Pick a language, and I did – Spanish. I took it in high school and middle school, and I live in California, which is where a whole bunch of Spanish speakers live, not to mention that the language is baked into the history of the state. It's a no-brainer. I booted up Mondly, a language learning app, in my Gear VR and chose Spanish. Immediately, I was thrown into the fire, as Mondly has a host of scenes where you have to speak a foreign language with someone. I was on a train with a woman sitting in front of me. She just started speaking Spanish, saying "Buenas dias." Simple, I remember that, so I answered back with the same. Then things took a turn for the worse. She started saying things I just didn't understand. If this had been real life, I would have meekly let out an "uhh" and look around for an English speaker for help. They do often say that actually immersing yourself in a culture that speaks a language is the best way to learn it, so – no pun intended – I was on the right tracks. VR however can do things real life can't – like give you instant help when you need it. For instance, when someone speaks in Mondly, there's a transcription of what they said next to them. That way, you can slightly process what it is without relying on your memory of foreign words you didn't understand. If you look at the transcription, a translation appears below it. I used this to my advantage. I'd hear what they said, read what they said and then consider a response and speak. There are a few suggestions from Mondly, so I went exclusively with those. If I didn't understand them, I just checked the translation underneath. It turns out this is a lot better than sitting down with a book and working out conjugation, what words mean what and trying to piece things together in your head, building up a knowledge base of an entirely different language. That's always felt stilted and boring to me, and it kills the fun of a language – especially something as romantic and passionate as Spanish. Instead, I had to train the part of my brain that focused on communication. I had to think like a Spanish speaker, instantly trying to decipher what the other person was saying and trying to respond in kind. That's not to say I took to it and was immediately speaking fluent, beautiful Spanish. Not at all, but it did give me confidence that I could handle a situation should it come up. Speaking of which, the thing about technology is that it can get frustrating – especially when a microphone and voice tech is involved. In Mondly you respond in Spanish and the app checks what you said to make sure you made sense. The problem is that sometimes it doesn't pick up what you say, or it picks it up incorrectly, and you have to get the pronunciation so perfectly right that messing up a small sound will have you repeating the same phrase 20 times like an idiot. There was a scene where I had to ask the general manager of a hotel for another room two dozen times in a row. Each time, it wasn't able to understand what I said so it would ask me to repeat. I was so frustrated I was ready to cancel my reservation and stay somewhere else. This is where it becomes clear that VR can't offer the natural learning that real life can afford. Sure, VR makes the initial learning more interesting and fun than simply studying a book and figuring out grammar rules. Language is alive, it has feeling, it has nuance and context that you can't see in a book. The tone with which someone speaks, their expressions, these help you naturally soak in a language. VR can help you get partly there, simulating some of that stuff. But when you're in the thick of it, and need corrections, you're basically talking to a robot. All the nuance is lost and the language goes from feeling alive to feeling dead. How I wished I could have asked a teacher to help me figure out what I was pronouncing wrong rather than listening to the answer. But was I really learning anything? Couldn't I just coast off these fairly scripted conversations and look at translations all the time? That's why I took about a week off and then went back and did the whole lesson again. I tend to find that I learn things the best, especially memory-based things like language, when I take a break from it so I can test how much I actually learned. Regardless, the second time, I found that I was far more confident. I even eschewed the suggested dialogue choices and went with my own stuff. No, Mondly Spanish taxi driver, I'm not a profesor, ingenioro or enfermera, I'm a periodista! Alas, despite the technique of VR language learning working, the constraints of the technology left me wanting more. I want to learn more Spanish, I want to get more confident and be able to talk about more things, not just in certain scenarios – getting a taxi, checking in at a hotel, talking to a stranger and ordering food. I want to be able to start and hold conversations about anything with anyone. VR can't yet give me that – for that I'll have to actually go out and spend some time in a place that predominantly speaks Spanish. So if you truly want to go off and become fluent in a language, the best way is still the natural, real way. 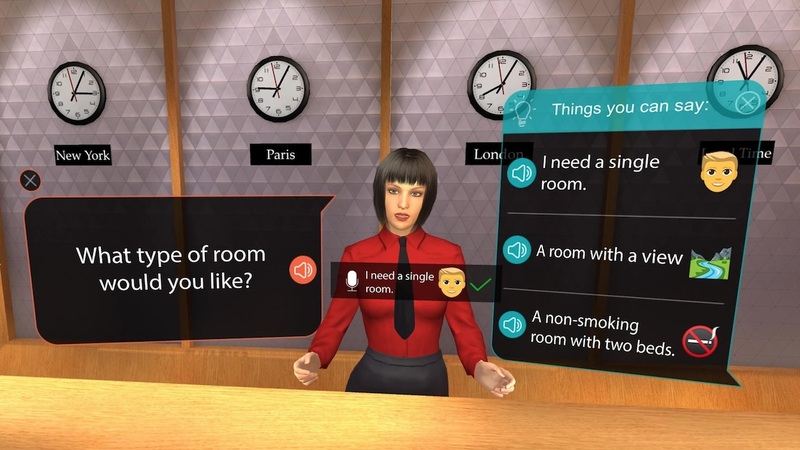 However, if you're headed on vacation and need to freshen up and build some confidence to help you get around, learning a language through VR definitely has its benefits.